The Supercharger GX Rohloff HS from Riese & Müller is the Rolls Royce of electric bikes, and an amazing experience as a speed e-bike. New for 2019, and in response to huge customer demand, E-14 electronic shifting now comes as standard. At the touch of a button, the Rohloff responds instantaneously with smooth, effortless shifting. Sheer luxury in itself. With an assisted speed of 45 km/h (28 miles/hour), this speed e-bike takes cycling to another level. At the heart of this top of the range ebike is the Rohloff gearing. Its huge transmission ratio, over 520%, with 14-speed hub gears puts the Supercharger GX Rohloff HS in a class of its own. The Rohloff has been developed for both pros and performance oriented hobby cyclists who can appreciate it because of its reliability. Perfect single gear ratios, wide range of gears, low maintenance and easy operation. Its weight and efficiency are ideal even for pro racing. The sealed gearbox ensures reliability and durability even under the toughest conditions. The even increments of 13.6% between gears make it possible to ride continuously at peak performance. The overall range makes sure that you always have access to the right gear regardless of situation. Pure fun is guaranteed. Make no mistake, the Rohloff is practically bullet proof, maintenance free and represents the ultimate in gear shifting. There is no wear on the indexing system nor is there any need to adjust it. Furthermore, fitted as standard is the silent and bomb-proof Gates carbon drive belt for even greater luxury. The GX Rohloff version of the Supercharger is one of several in Riese & Müller’s range. Each one features stunning new technology and unique design.The 2019 Supercharger comes as standard with 2 x 500Wh Bosch PowerTubes. Both are beautifully and cleverly integrated into RM’s unique frame design. 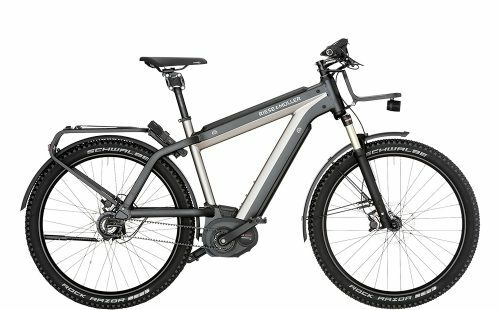 Riese & Müller is doubling the range of its electric bikes with dual battery technology by adding a second battery, but that’s not all. Both batteries can be charged at the same time. Both batteries deliver power to the bike at the same time also. Depending on your needs, you can also use just one battery to go on a ride. Its dual battery technology puts Riese & Müller at the top of its class in terms of riding range. Most striking is its multi-award-winning design, followed by its athletic features. The Supercharger models are like a six-pack cast in aluminium. A precisely-conceived geometry guarantee the ultimate in riding comfort. The Bosch Performance Speed drive rated at 60Nm delivers power above and beyond with its high torque. With 2 x 500Wh batteries as standard, the Supercharger GX Rohloff HS simply keeps on going. With its tremendous 350W motor, the GX Rohloff HS is capable of conquering any mountain and terrain. Hydraulic Magura MT4 disc brakes provide unrivalled braking performance. A strong Busch & Müller high intensity lamp on the front illuminates the road ahead. The rear tail light is again provided by BM, a Supernova M99. The Supercharger GX Rohloff comes with some nifty anti-theft features too. An ABUS Bordo Plus wheel lock mounted behind the seatpost prevents opportunistic theft. Both the ABUS and battery lock share the same key, which means you only need one key to do both jobs. The standard Intuvia Display or optional Kiox Display provide all rider information clearly and concisely. Pleasing aesthetics continue thanks to hidden cable runs under the top tube and through the frame. Furthermore, a Cane Creek Thudbuster ST suspension seatpost ensures ultra rider comfort. The GX Rohloff HS Supercharger has to be the ultimate in luxury.